Our Quick Conversion Kit™ offers 2 - 30 oz jars of sugar product plus everything you need to get working immediately at a low introductory cost. Many people are familiar with the tradition of using sugar paste for hair removal. For centuries various forms of sugar have been cooked and used on family members to give them hair-free skin. 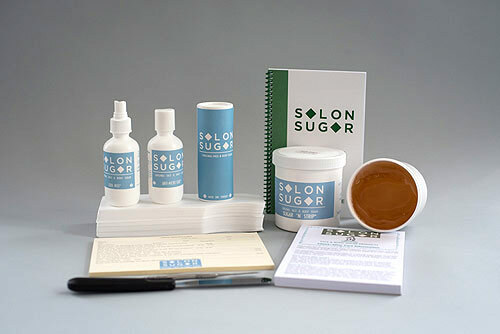 Flash forward to the 21st century and discover Salon Sugar® products providing you with consistent, commercial grade, salon quality sugar pastes. Over the years, salon professionals have told us how reluctant they have been to offer full body waxing because of client pain and their lack of control with wax/resin products. Their original training made them aware of the urgent need to remove the wax quickly to avoid damaging the client's skin. Experienced salon professionals now realize that this high stress "rip it off" method goes against the type of holistic business many would like to develop. Salon Sugar Products, Inc offers two comprehensive programs supported by manuals, tests, and videos that will change your opinion on hair removal. Our products are so safe and easy to use that they unlock the door to significant hair removal revenues. Our education, safety and hygiene standards meet all the highest State Board/OSHA requirements. Which of our programs feels like the best fit for your hair removal style?